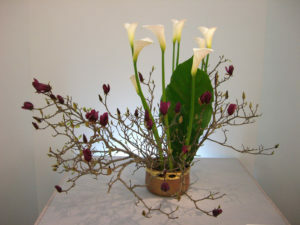 Ikebana is a traditional Japanese arrangement of live flowers. In literal translation, they are revived flowers. In order to really be a ikebane, this adjustment requires time, patience and aesthetic feeling, so that the resulting arrangement is a decoration of the interior. It is precisely the placement of flowers in space that is most important in order to excel their beauty. Depending on the location, you need to choose the size and height of the ikebana, but also the shape and color of the pot or vase in which the flowers will be placed. Everything must be perfectly matched to make the ikebana a natural and harmonious whole with space. Of course, you need freshly cut flowers, gardening shears for stalks and kenzan, which is a heavy metal stick pad. Flowers are attached to the kennan when arranged in flat containers. For long-term ikebana durability it is good to use a sprayer. Unlike cutting stems of flowers into vases with angled cuts, the flowers in the ikebana are cut straight and underwater because they instantly draw water. If the stem is too thin or brittle and can not be attached to the stem, we can wrap it with soft paper or attach a piece of stronger stem to its end. Small fine flowers can be tied to small bundles and stalked with thin paper. In Japanese ikebana, rules of mutual proportions and angles have to be maintained. The special feature of ikebana is that kenzane is not placed in the center of the container, but rather in one corner or edge. We proceed so that one stem is the main and the longest, followed by the middle and the shortest. We tilt these three stems at certain angles according to our imagination. The ikebana rules determine the length of the main stem so that it is usually the sum of the height and diameter of the container. The length of the middle stem should be three quarters of the main stem and the length of the shortest three quarters of the middle. These figures, however, are not a dogma, but an aid. There are no rules for containers. It depends on what we have and what will fit into the space. Ikebana can be both in a high and slim weighing, both in bacon and low, or even flat as a plate. It does not have to be any expensive vases; on the contrary, ideal are ceramic vessels of modern shape, as only a color combination of flowers can be distinguished.